Although there have been no successful attacks off Somalia for some time, piracy, armed robbery and kidnapping of seafarers in West Africa and Asia are a current concern. Indonesia recently released advice to vessels in the area to avoid certain danger areas, such as the South Philippine waters of the Sulu Sea, fearing piracy could rise to Somali levels. 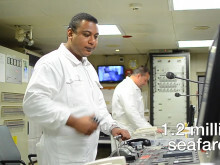 In some countries, training on piracy has become compulsory for seafarers prior to departure. Over the past four years, ISWAN’s Maritime Piracy Humanitarian Response Programme has become a leading provider of piracy awareness training for seafarers. Based on industry best practice guides, ISWAN’s training courses give companies and manning agents a template for helping seafarers and their families deal with cases of armed robbery and piracy attack. This interactive new elearning course on piracy, which draws on ISWAN’s expertise, provides seafarers with an understanding of anti-piracy measures and promotes strategies for dealing with an attack. The course focuses on ensuring seafarers have the mental resilience to remain strong during their ordeal. It also addresses the issue of post-traumatic stress, explaining what it is, how seafarers and their families can cope with the condition and where they can get help. The new course will be available later next month (July) via the Marlins online shop and will be included in the next update for all subscribers to Marlins eLearning Suite for Seafarers. ISWAN is an international charity dedicated to the relief of need, hardship or distress among seafarers of all nationalities, races, colour and creeds and irrespective of gender.